Vaishno Devi also known as Vaishnavi and Mata Rani is a manifestation of Mother Goddess. Vaishno Devi was a devotee of Lord Vishnu in the form of Shree Ram. 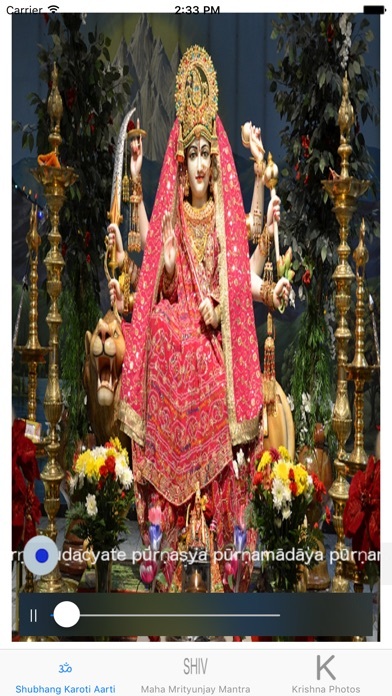 Vaishno Devi is known to bless her devotees with good health and prosperity. Start your day by listening to this aarti devoted to Vaishno Devi and you will find yourself filled with positive energy that will last throughout the day. Optimised for iPhone 7, 7 Plus and earlier. - Update for iOS 10. - Introducing 3D Touch, Force Touch on the main photo, to view photo in full and back. - Optimised for iPhone 7, 7 Plus and earlier. Moraya. Moraya. Jai Shree Moreshwaraya. Jai Shree Ganesh. Ganapathi Bappa Moraya. Jai Shree Ram. Jai Shree Krishna. Om Namoh Bhagwate Vasudevaya. Om Namoh Shivaya. Jai Shiv Shankar.